Iridium Studios have really got something special with There Came an Echo. I’ve never been a big fan of the real-time strategy genre, mostly because I’m terrible at it. I could never get the hang of which troops I should send where, or remember what weapons and units were most effective in any given situation. My worst problem was trying (and failing) to get everything done in a speedy, efficient manner before being overtaken and defeated. Oftentimes games like StarCraft and Age of Empires would overwhelm me simply because I could not keep up. 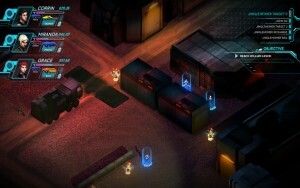 There Came an Echo is unlike any RTS I’ve played before, and one that could make me actually enjoy the genre. Of course compared to titles like StarCraft and Age of Empires, There Came an Echo is pretty bare-bones, but that’s part of what makes it so good. First of all, there are never more than four characters in your control at any given time. The levels are much more intimate and compact compared to your typical, open-map RTS. No building structures or collecting resources here. You tell your party where to go and what to shoot at, and that’s essentially it. You really have to tell them, too. 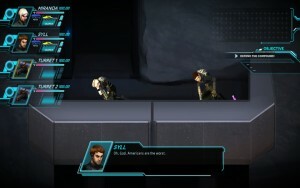 Playing the game still requires some quick thinking, as leaving your party clumped too close together or wielding an inappropriate gun for the job will see you dead post haste, but the voice activation makes it so much easier and more intuitive for an RTS amateur like myself. You can still play with classic RTS-styled controls if you prefer, dragging to select units and clicking where to go, but that is not how There Came an Echo is meant to be played. In fact it will likely make the game more difficult and stressful. This is because when playing the game you assume the role of the all-seeing-but-never-seen omnipotent being, Sam. 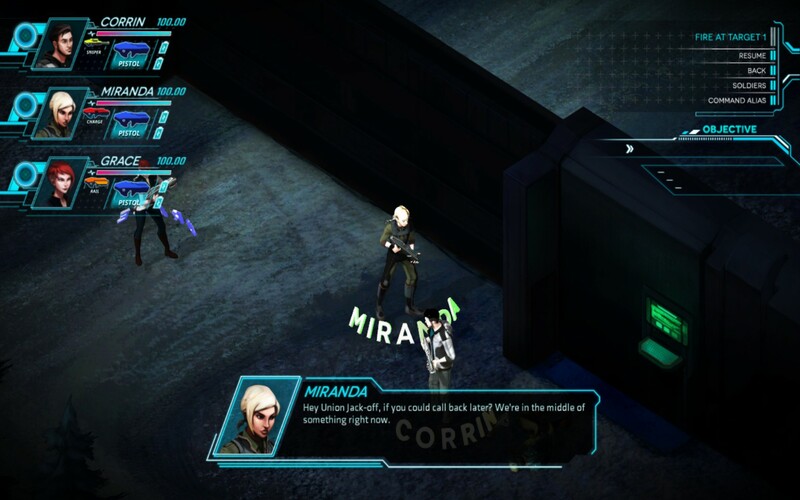 Your partner, the similarly omnipotent and similarly invisible Val (played wonderfully by Ashly Burch), is the part of your duo that talks directly to the party members – those on-screen doing the fighting and driving the plot. When you speak into the microphone and say, “Corrin, Alpha 1″ Corrin moves to the Alpha 1 location immediately. However if you click your instructions traditionally, once you’ve selected Corrin and his destination Val will then say, “Corrin, move to Alpha 1.” before he takes off. It takes twice as long because ultimately, the players must be told what to do and where to go. The most impressive thing about the vocal recognition is simply how much variety the game picks up on. If you’re not a fan of the characters’ given names of Corrin, Miranda, Grace, and Syll, you can change them to Joe, Billy-Bob, Henry, and Steve. Their names won’t change for cutscenes, but they will respond when you boss them around. I tried multiple combinations including Zak (me), Heather (wife), Kelly and Matt (friends); Huey, Duey, Louie, and Scrooge; and John, Jacob, Jingleheimer, and Schmidt. Of those combinations only Schmidt gave me trouble, and that’s because it sounded too much like “shoot.” Saying “Jingleheimer, Schmidt, Bravo 3″ would in turn make Jingleheimer (love that name) alone shoot at Bravo 3 instead of the two of them walking to the destination. Part of that can be attributed to lazy pronunciation, as you MUST speak clearly and concisely for your commands to go through as you intend. It doesn’t have to be 100% perfect, but in situations like that where the name sounds incredibly like another command, you really need to make sure you’re enunciating properly. I’ve also got a slight lisp, which caused some troubles whenever I tried to command Syll or change to the Screw Gun. So fellow lispers, easy names like Bob will be useful here. By the way, curse words aren’t even out of the question. An earlier trailer for the game proved that, with glorious results. Okay, so the vocal recognition is solid, but what about the actual game? Is it worthwhile? Simply put, yes. The story starts off with high suspense and action, and that momentum carries through to the very end. It weaves in some emotional drama, is revealed as a [spoiler removed] to [spoiler removed], ends on an unexpected (but still solid) note. Oh, and the end credits are just delightful. Never seen anything like it before. So stick around for those. Regarding the team at Iridium, they have been incredibly dedicated to making the launch of There Came an Echo as smooth and enjoyable as possible. Case in point: I played a mission that I straight-up couldn’t beat. I had very few problems with the difficulty prior, but suddenly this one mission just halted my progress. It was infuriating. I took to Twitter to voice my confusion and frustration at the sudden ramped up difficulty, and within minutes someone from Iridium was replying to me, discussing my issue with me to work out if it was user-error, a glitch, or something else. Based on our chat he (or she?) deduced that it sounded like a glitch, as the game was supposed to supply me with restorative items that I hadn’t seen. They said they’d look into it and work on a fix, and put it live ASAP. I went to sleep then headed to work the next morning, and by the time I was home I had another reply saying the fix was taken care of. Sure enough, I loaded up the game and beat the mission on my first try. I was (and am) truly impressed by their efficiency. If I had to find a gripe, it would be that the game is much too short. There are around 10 missions in total, but the first half of those are various tutorials and gaining party members. You can start and finish the game in a single afternoon, and that’s not necessarily bad, but when the finale came I only just felt like I was hitting my stride. There is the War Room option on the main menu, which allows you to take on challenges to improve your strategies and tighten your commands, but that only goes so far in increasing playtime. I want more, Iridium! In saying that I’m certain they will bring us more. Not necessarily in expanded content for There Came an Echo, but in their continued innovations and refining of an already amazing concept. I had not heard of Iridium Studios before hearing of There Came an Echo, but it has successfully grabbed my attention enough to keep an eye on them moving forward. I’m expecting big things from this team. There Came an Echo was developed and published by Iridium Studios for the PC. Ports to the PlayStation 4 and Xbox One are slated to drop later this year. A review code for the game was provided to Save/Continue by the publisher for review purposes.